Do you feel tired after a whole day work? Are you looking of the best massage cushion? Why leave the comfort of your home to enjoy a full-body, professional-quality massage? With the MC2 Luxury 3D massage chair pad, your home becomes place for your favorite spa. Sleek in design, the MC2 portable massage chair offers premium-grade Shiatsu massage therapy. MC2 are ready to relieve improve blood circulation and achy muscles for you . More versatile than ever, it now comes equipped with added features that will make your massage experience simply extraordinary. The new MC2 focuses independently on your upper back,full back,and lower back areas. It also targets the neck region from multiple angles, bringing Shiatsu and rolling massage therapy to the rescue. From top to bottom, the MC2 portable massage chair delivers. SPECIALLY DESIGNED 3D ROTATING BALLS: The 3D rotating balls are specially designed to penetrate deep into your muscle tissue. In this way, the strong kneading and penetration imitates a real massage therapist hands. 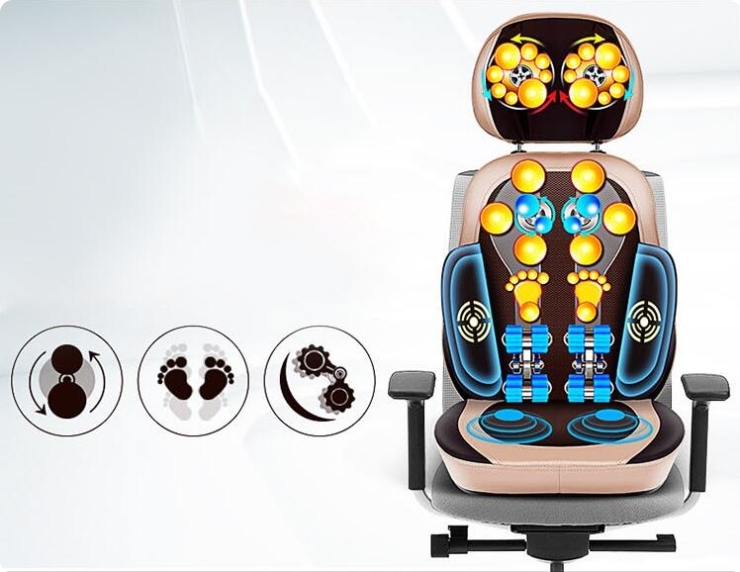 Included is an adapter for the home and car, so you can use the shiatsu massage cushion to make any chair the best seat in the house, office or car! 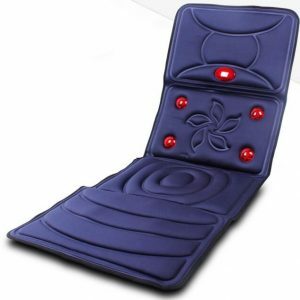 HIP VIBRATION MASSAGE: The massage chair pad features three levels of vibration massage, including high, medium and low. SAFE TO USE: This portable massage chair has an automatic 15-minute shut off feature that protects the device from damage and conserves energy in case you forget to turn the massager off. You can enjoy massage any time and any where in you daily life: This best massage cushion will keep you feeling relaxed all day at home,at the office or in the car! 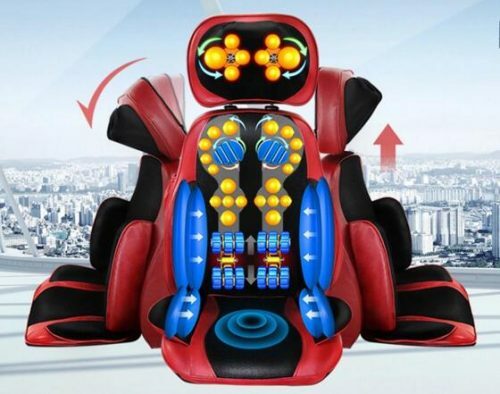 Uniquely designed airbags that are strategically located throughout the portable massage chair inflate and deflate independently to provide relief of muscle tension and a wonderfully soothing effect. Airbags are programmed to apply acupressure to shoulders, arms, hips, calves (3 levels of airbag intensity control). 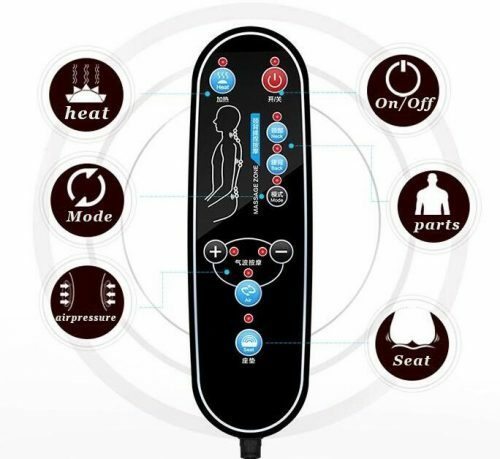 To your family,friends,lover,colleagues: This massage chair pad is a perfet gift for Thanksgiving,Chrismas,Father’s Day,Mother’s day,Birthday and Parties. After a long day dealing with the office work or housework,this product is a great way to unwind and relax. It really does help your back and muscles feel less tight and I feel that since using it you will be sleeping better at night as well. This is the best massage cushion and if your looking for a great massager we highly recommend this one. This massage chair pad has three massage variations- full back, lower back and upper back massage. This making it versatile and perfect to use in the office or at home. It is really a great product if you’re looking for a lower back massager with heat. To ensure complete customer satisfaction, we at AINICS will always work hard to solve any problem you might have with any of our massagers. We warrant our retail products to be free from defects in materials and workmanship that result in failure during normal usage. With its adjustable back strap,It can be easily attached to any chair you want. 1. Heating function that soothes aching muscles. 2. Relieve shoulder pain, blood circulation problem pain, fatigue from excessive and stress. 3. Ergonomic design is perfect to use on lower and upper-back, neck, abdomen, calf and thigh areas. Please check that the power plug is firmly connected to the outlet If your massager is not operating properly. Please also confirm that the power supply cable DC connector is securely snapped into place. When the Shiatsu massage cushion is powered off,it is programmed to ‘park’ at the bottom of its rolling track. The massager will continue to ‘park’ once power is restored If power is cut. It may be that the device needs to cycle through its ‘parking’ routine,If your device is not responding to remote control commands upon initial powering on of the device. 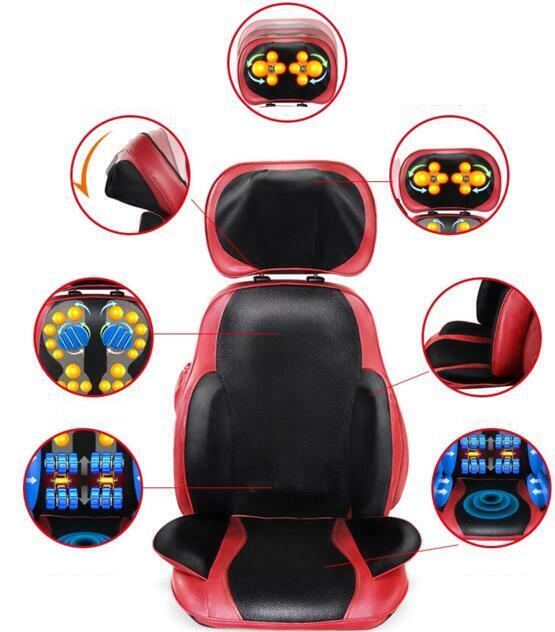 How to operate this Shiatsu massage cushion? 1. Plug the AC Adapter into an electrical outlet in your room. 2. Fix the back strap to your chair. 3. Sit on the cushion in a comfortable position. 4. 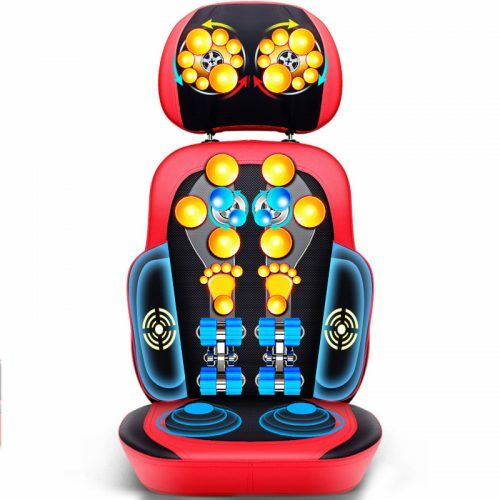 Press the power button once to turn on the massager. 5. 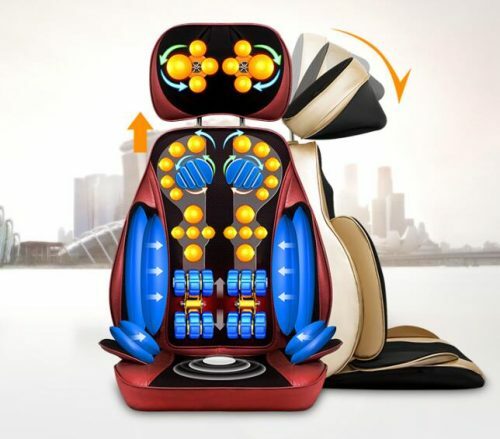 Pressing the “up” or “down” buttons will make the massage nodes go straight up or straight down. 6. Start your warm, shiatsu massage just the way you like it! 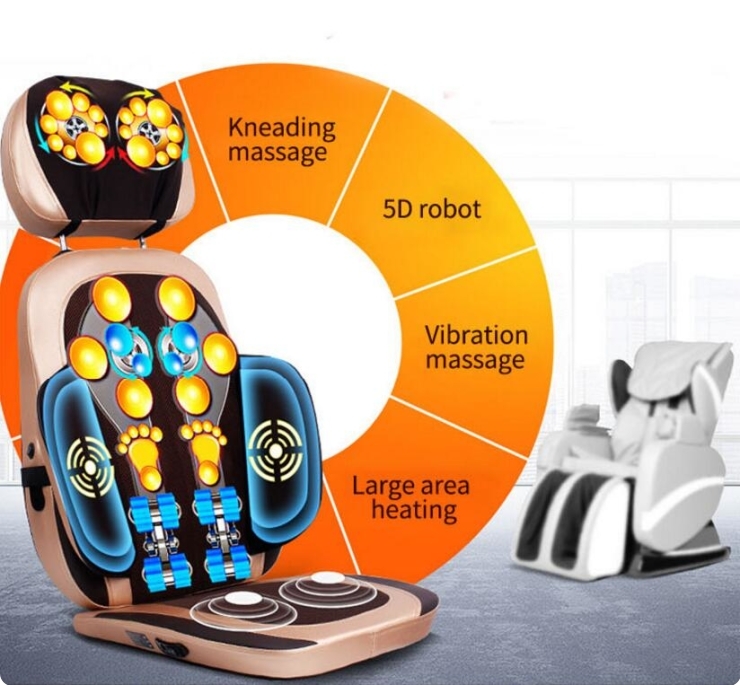 Original Manufacturer: To deliver the lowest cost and highest quality massage chair pad to our customers, AINCS took the extra step to delivery this Shiatsu massage cushion to clients directly. That means we cut all the traders and wholesalers process to save cost for clients. 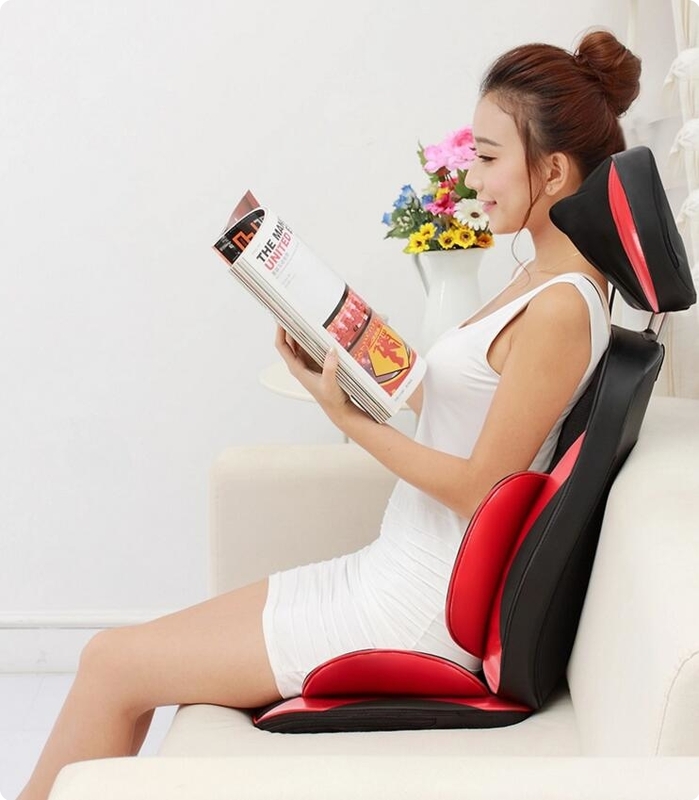 If you are looking for the best massage cushion,you don’t need to go to the traders and wholesalers store to waste a big cost. AINICS MC2 SHIATSU neck and back massage cushion with heat. Deep kneading and rolling massages at the neck, upper back and lower back help relieve muscle tension and improve blood circulation.It can also treat upper and lower back pain. Built-in double vibrating motors at the hip relaxes the body and strengthen metabolism. The unique up-down motion of the massage nodes was designed with the concept of somatology. To imitate real full body rolling and kneading massage with human hands,Multiple massage heads work together. Used everyday for almost 2 week, everything works good as they mention. Loves the neck part, it can be adjustable base on the high of the person. Heating on the back and vabrated on the base. Love it. 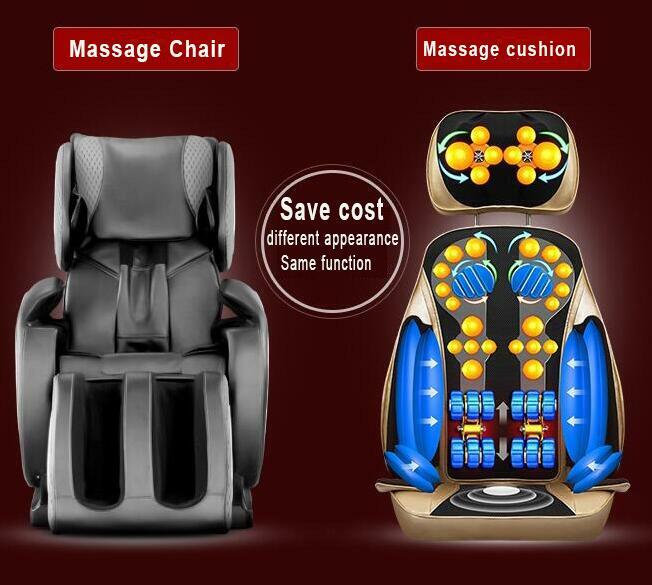 It has been long-time for me to think about to buy a massage cushion or massage chair. Finally, I invested this massage cushion instead of the expensive chair. 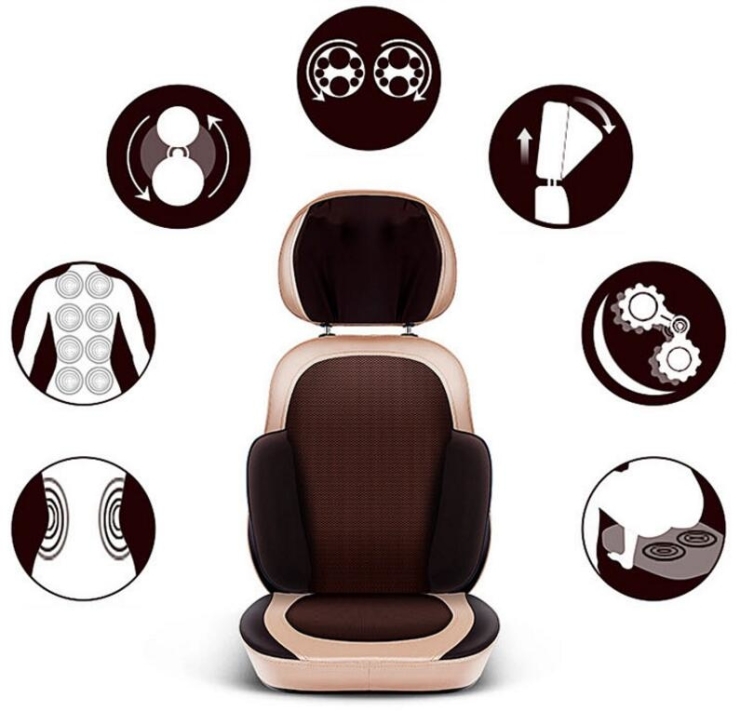 The other feature of this cushion is portable, which is able to be used in the car, imaging when you have a long driving, you feel tired in the back, you can plugin and relax with this little thing. Bought this for my husband to help with his sciatica nerve pain and other back and shoulder pains. Every one in the household will use it to relax. So it has served its purpose. It is pretty intense and can hurt depending on what settings you use. I can only use the neck and lower back because I don’t have the meat on my body to take all of it without it hurting. My husband can use every setting, one of my daughters uses the upper massage for her shoulder and neck – and so on and so forth. Each of us use it differently. We all have enjoyed using it. This is a very powerful massage cushion. My husband works in front of the computer over 10 hours every day. He tried this cushion at his desk and was very satisfied with massage function. He said that it can work all the way to his deep muscle. It felt like professional massage therapist hands, powerful and effective. The cushion had adjustable functions to work on lower or upper back and allowed him to massage on the spot he wanted. He loved this gift very much. The cushion also has the car charger converter. It would be nice for our upcoming road trip in spring. The back massager is well-made and fits my back perfectly. This is the first massager that I’ve used that covers most of my sore spots. The neck massager is adjustable up and down to fit your body. The heat is great. I highly recommend it. I pretty much sit all day at work so my neck and back get aches and pains. I’ve bought massager before but they were for specific parts of the body. This is the one for whole body.I came across this Shiatsu massager and decided to give it a try and it works. It applies enough pressure to relieve and relax my body. There are different modes to choose from and I prefer the strongest. It’s well built and sturdy. So far, I am liking it and have been using it everyday while watching tv. The cushion is so light to move around yet it produce enough power to give thorough full back massage. I can literally turn any chair into a stress relieve massage chair now. Good coverage – The massage nodes can move up and down to cover the whole back, or stays at upper/lower back area, or the specific spot. It would be perfect if the nodes can go up higher to cover the neck and shoulder area as well. 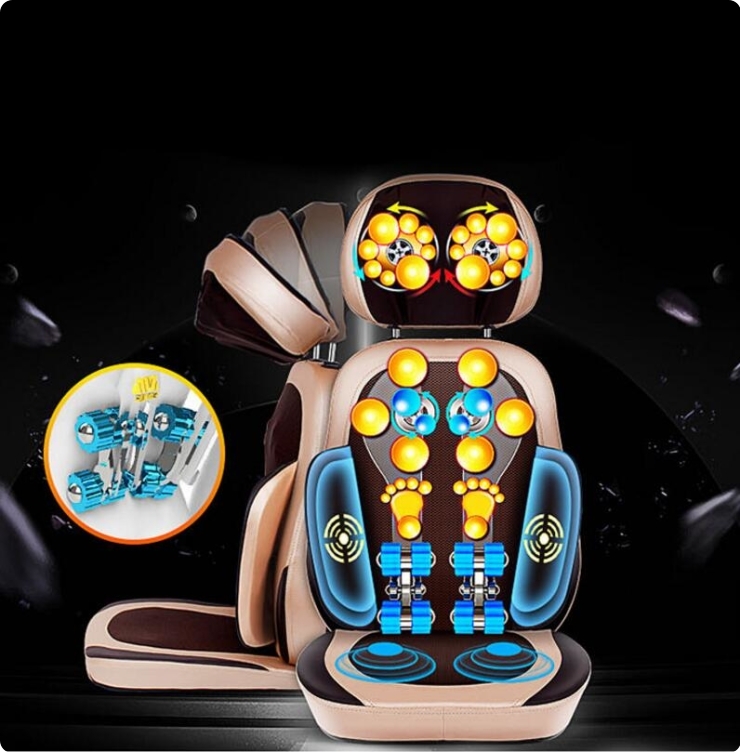 Strong massage power – The massage power is as strong as the massage chair which is little surprise to me considering the size of the cushion. Vibration – I really enjoy this feature. It helps blood circulation and make me feel relax after a long work sitting in the chair. I absolutely love this product.I have given two of them away after friends and family tried it. The way it massages the whole body is really superb. This is what I need! I bought it 3 months before,Now it’s work well.Very quality products! This Back massage cushion is amazing! It’s easy to put anywhere I want! It also helped me saved lot of my space. I bought two totally. I am going to put one in my car, and another one in my room. Such a reasonable price and very relaxing. There are different modes.I can choose from full back, upper back, bottom back and seat. Also It can heat my seat very nicely. I am very happy with my item! Very comfortable to sit! I sometime have back pain since everyday sit in front of computer, hope this one will cure me instead let me do yoga in fitness everyday.